There's no need to keep using cotton balls when trying to remove nail foils. These Artisan Nail Foil Remover Wraps were designed to handle the job! They're extra-thick and durable enough to get it done! That's what they tell me. All I know is that we sold A LOT last week!... why? I have no idea... I'm just a shipping guy! See our great Artisan Nail Remover Wrap HERE! A must for every treatment room, the Triple Roll Dispenser makes it easy to store and dispense multiple rolls of paper. It can hold three rolls of paper, plastic or foil up to 36" wide. It has a paper cutter at the top of the unit that will cut to the left or the right, enabling the technician to cut just the amount of paper needed. The dispenser is lightweight and has wheels on one end, making it easy to move within the treatment room or from room to room. Made of powder-coated metal rods. 36.75" H x 39.5" W x 13" deep at the floor level. Makes it easy to store and dispense multiple rolls of paper. 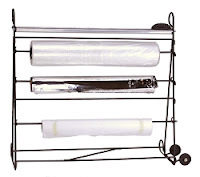 Can hold three rolls of paper, plastic or foil up to 36" wide. Has a paper cutter at the top of the unit that will cut to the left or the right, enabling the technician to cut just the amount of paper needed. Lightweight - has wheels on one end, making it easy to move within the treatment room or from room to room. Sleek design uses a non-drip cap your developers, shampoos, and conditioners for easy dispensing. Holds most liter bottles and soft packs. Eliminates waste and saves money, dispensing every last drop of liquid. Keeps color bars and shampoo areas and clean. 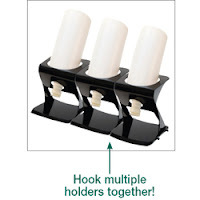 Multiple holders can be hooked together for organization. Includes a non-drip cap. Keep your headrest covers at your finger tips with this eye pleasing headrest cover dispenser. Made from attractive wood, this sturdy dispenser can be mounted on your wall to save space in small rooms or placed on a countertop. 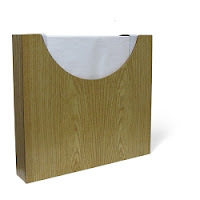 Holds 12" x 12" paper (Mounting hardware included). 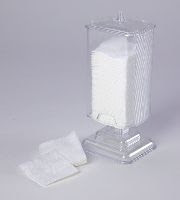 14.5"W X 13.5"H X 2.5"D.
This clear acrylic 2" x 2" Dispenser fits unobtrusively into the décor of any treatment room. 3"W x 2.5"D x 7.25" H. Includes cover to keep 2" x 2" pads clean and dry. Dispenser fits unobtrusively into the décor of any treatment room. Keeps 2" x 2" pads clean and dry.